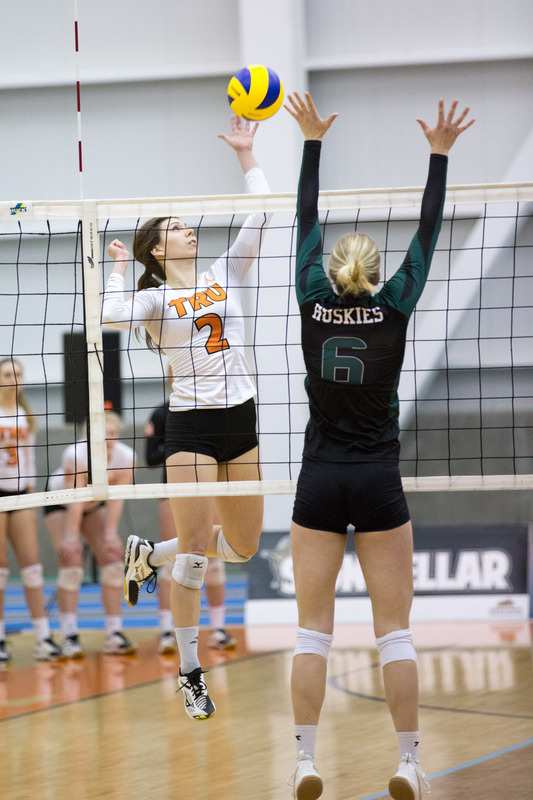 The TRU women’s volleyball team split games with the Saskatchewan Huskies in two thrilling encounters. The WolfPack women’s volleyball team lost in five sets, 28-26,16-25,19-25, 25-20,16-14 to the Saskatchewan Huskies on Friday January 19 on the Warner Rentals court, TCC, Kamloops, BC. It was a thrilling encounter that had a lot of momentum shifts. It was obvious from the onset that both teams were evenly matched, the game was tied at 11 all in the first set. There seemed to be a lack of consistency from both teams, with TRU looking dominant at times and then Saskatchewan looking dominant at times. The momentum shifts in the contest made it an extremely entertaining contest for the crowd in attendance. The game was tied for most of the first set until Saskatchewan seized control and won the first set 28-26. The second started with TRU leading 13-8, but like the first set both teams had problems returning serve. TRU eventually won the second set by nine, 25-16, in what seemed like a game changer after having lost the first set. TRU continued the good work in the third set, winning the set 25-19. At that point it appeared as though TRU was in control, they had recovered extremely well from the first set and confidence was high. Despite that though the huskies rallied and came back to win the fourth set 25-20. The final set was just as thrilling as the first four, the game was tied at four all early on and then TRU led 8-7. The lead changed many times before the Huskies won the final two points to win the tipsy turvy contest. Rachael Windhorst was top performer for TRU with 20 kills, 3 assists and 13 digs, Yvegeniya Nyukhalova had 12 kills and 12 digs, Mikayla Funk had 7 kills, 15 digs and 6 service aces and Anastasiya Muzyka had 37 assists and 3 service aces. TRU head coach Chad Grimm spoke to The Omega after the game and acknowledged that serving was a major factor in the result of the game. The TRU women’s team was able to bounce back and beat the Saskatchewan Huskies in four sets, 26-28, 26-24, 25-14, 25-8 on Saturday. The game began like the night before, with the Huskies winning a close first set, 28-26. TRU led late in the second set, 24-20, when Saskatchewan made a small comeback. Despite that, the WolfPack was able to hold them off winning the second set 26-24. From that point on it was one-way traffic with TRU dominating the third set, which TRU won by nine, 25-14. The fourth was even more dominant than the third, TRU won 25-8. Rachel Windhorst was top performer yet again with 15 kills, 6 digs and 1 assist, Yevgeninya Nyukhalova had 12 kills, 9 digs and 2 service aces, Anastasiya Muzyka once again had the highest number of assists with 19 assists and 3 digs. Head coach Chad Grimm was impressed with his team’s performance, “We did a better job on picking up on picks and rolls. We made them score the ball a little bit more,” he told TRU athletics. “We didn’t let them get out of jail in bad situations. We served the ball tough and Saskatchewan struggled on serve/reception. Teams know that once you pass off the net, blocks can be set up. Kaitlin in the middle closed the blocks and put them in trouble,” he concluded. After the weekend’s Usport action TRU are 7-11 and are still in with a shot to make the playoffs. TRU seemed to be more consistent and able to capitalize momentum in the second game than they were in the first. It was a mixed bag of results, TRU will be hoping they can be consistent more often in their performances like they were in the second game.